Penrose & Associates Physical Therapy Answers: Why Does Knee Pain Increase in the Spring? This time of year we see more people than ever in the clinic suffering with painful knees. The reason why? Because it’s around this time of year that people decide to be more active and take things up like running and walking for longer distances. Or they start to go out in the yard and start squatting, lifting and kneeling more. In fact you shouldn’t “bend with your knees” unless you want to give yourself knee arthritis! You need to bend your hips correctly so you don’t beat up your knees or your low back! Even if they’re used to running, people tend to step it up and run a little longer than usual to get ready for the summer, sometimes adding in extra running days going from twice a week, to four times a week. What’s likely going on for this patient is something called “runner’s knee” – it got it’s nickname for an obvious and very unfortunate reason, because it’s common among runners, and even those who are brand new to running. 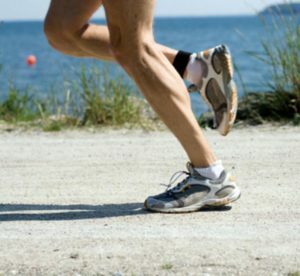 If we run often, after a while the stress of running can cause irritation around the knee area. The resulting pain can be sharp and sudden, or irritating and dull. Sometimes it disappears when you’re running, only to return again afterwards. The pain will generally feel worse when bending the knee, especially when walking or running downhill, or even something as simple as walking down a flight of stairs! So why is she feeling pain in her knees? Think of it like this – each time you run and bend your knee, your knee cap rubs against your thigh muscle, and just like if you were to rub your hand against your arm, eventually your arm would go red and become sore… Well the same happens with your knees! If you’re not used to running, OR, if you haven’t slowly built up how long you run for and how many times a week you choose to as well, then this is going to be a shock to your knees. Another thing, if the muscles around your knees are weak and tight, they’re not going to be able to support you through a run… And without strong muscles to support your knees joints (or just really tired and weak ones), you’re much more likely to suffer from aches and pains. So the solution to her problem? It’s likely to be a simple case of strengthening the knee muscles (and hip and lower back ones too), to make them stronger and support her when she runs – not MORE exercising. See, a lot of people think that exercising more is good for them, and it is to an extent, but only if you’re doing the right type of exercises to benefit everything else you’re doing. ent any aches and pains suddenly creeping up on you which could put you out for a few weeks, which is the last thing you want if you’re trying to keep active. Now you know why knee pain increases in the spring and what to do about it! We are hosting a free knee pain workshop April 12. You can call us at 360-456-1444 or register online at the Penrose & Associates Physical Therapy website.